This page is a translated version of the page Extension:SyntaxHighlight and the translation is 58% complete. The category may also be added, and the content will not be highlighted, if there are more than 1000 lines or more than 100 kB text. The start attribute (in combination with line) defines the first line number of the code block. For example, line start="55" will make line numbering start at 55. The highlight attribute specifies one or more lines that should be marked (by highlighting those lines with a different background color). You can specify multiple line numbers separated by commas (for example, highlight="1,4,8") or ranges using two line numbers and a hyphen (for example, highlight="5-7"). Note that the line number specification ignores any renumbering of the displayed line numbers with the start attribute. The attribute indicates that the source code should be inline as part of a paragraph (as opposed to being its own block). This option is available starting with MediaWiki 1.26. For backwards-compatibility, an enclose="none" attribute results in the same behavior. Note that line breaks can occur at any space between the opening and closing tags unless the source code is marked non-breakable with class="nowrap" (on those wikis that support it; see below) or style=white-space:nowrap. lambda x: x * 2 is a lambda expression in Python. <syntaxhighlight lang="Python" inline>lambda x: x * 2</syntaxhighlight> is a [[w:Lambda (programming)|lambda expression]] in Python. When inline is used, class="nowrap" (on those wikis that support it; not on MediaWiki itself) specifies that line breaks should not occur at spaces within the code block. The style attribute allows CSS attributes to be included directly. This is equivalent to enclosing the block in a <div> (not <span>) tag. The tab‑size attribute cannot be specified this way; it requires an enclosing <span> tag as described below under Advanced. $wgPygmentizePath （オプション）：Pygmentsパッケージを「ピグメント化する」（pygmentize）絶対パス。 The extension bundles the Pygments package and $wgPygmentizePath points to the bundled version by default, but you can point to a different version, if you want to. For example: $wgPygmentizePath = "/usr/local/bin/pygmentize";. After updating to MediaWiki v1.26 and above, some users started reporting problems with the extension. There could be cases, when some languages, such as Lua might not get highlighted and by turning on debugging, MediaWiki would throw out the error, Notice: Failed to invoke Pygments: /usr/bin/env: python3: No such file or directory. 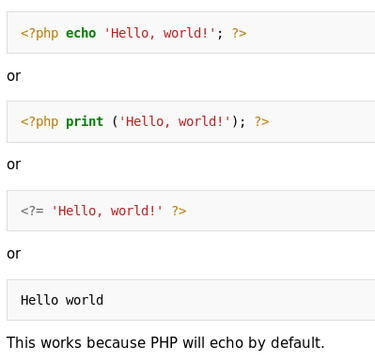 Try pointing $wgPygmentizePath in LocalSettings.php towards an external pygmentize binary. See the phabricator task on this for further suggestions and information. Unlike the <pre> and <code> tags, HTML character entities such as &nbsp; need not (and should not) have the & character escaped as &amp;. Like the <pre> tag but unlike the <code> tag, tags within the range (other than its own closing tag) need not have the < symbol escaped as &lt;, nor does wikitext need to be escaped with a <nowiki> tag. Furthermore, while <pre> assumes tab stops every 8 characters and renders tabs using actual spaces when the rendered text is copied, <syntaxhighlight> uses 4-space tab stops (except Internet Explorer, which uses 8) and preserves the tab characters in the rendered text; the latter may be changed using an enclosing <span style="-moz-tab-size:nn; -o-tab-size:nn; tab-size:nn;"> tag (not <div>, and not using its own style attribute). The -moz- prefix is required for Firefox (from version 4.0), and the -o- prefix is required for Opera (from version 10.60 to version 15). (Note that the wiki editing box assumes 8-space tabs.) This applies only to actual saved pages; previews generated through an edit box or Special:ExpandTemplates may differ. Extension:GoogleCodePrettify – syntax highlighter that uses Google Code Prettify library. Extension:SyntaxHighlighter – syntax highlighter that uses SyntaxHighlighter library. Extension:ViewFiles – an extension, dependent on this one, to support highlighting text from files viewed via a special page. This page was last edited on 11 April 2019, at 12:33.